"The Savior is the source of true peace. 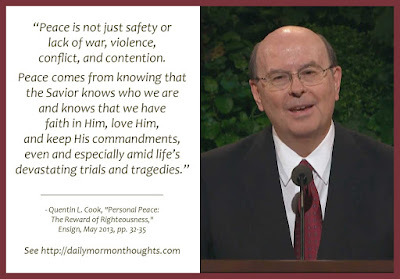 Even with the trials of life, because of the Savior's Atonement and His grace, righteous living will be rewarded with personal peace. In the intimate setting of the Passover chamber, the Savior promised His Apostles that they would be blessed with the 'Comforter, which is the Holy Ghost' and then uttered these important words: 'Peace I leave with you, my peace I give unto you: not as the world giveth, give I unto you' (John 14:26-27). Then just before His Intercessory Prayer: 'These things I have spoken unto you, that in me ye might have peace. In the world ye shall have tribulation: but be of good cheer; I have overcome the world' (John 16:33)." "We all long for peace." Why does it seem elusive? 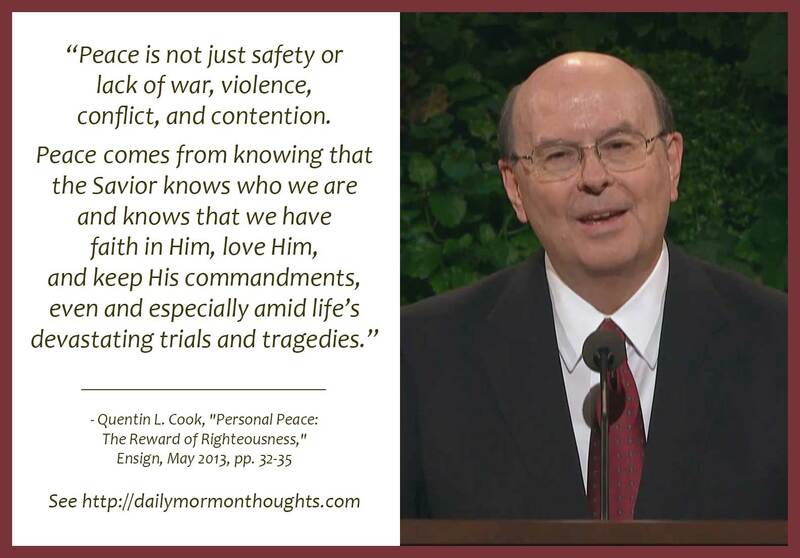 Elder Cook explains that true peace is not dependent on external conditions, but "comes from knowing that the Savior knows who we are"—a fascinating concept. 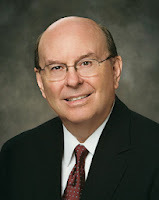 In order to maintain peace in our lives, we must "stay close to the Savior" by living humble, repentant, faithful lives. It's a wonderful promise that "righteous living will be rewarded with personal peace" regardless of the challenges of life.